Chilean rose tarantulas are easy to come by in pets stores. In fact, this species of spider (otherwise known as the rose hair tarantula or the Chilean fire tarantula) is widely distributed in North America due to the cheap export of wild-caught spiders and the proliferation of captive breeding by hobbyists. Wild Chilean rose tarantulas spend their time in the desert and dry grasslands of Chile, Bolivia, and Argentina feasting on insects, as well as lizards, mealworms, and small mammals. And they range in color from light grey to a subtle pink to a vibrant rose. For the spider lover, this species makes a superb pet, as it's docile demeanor and low maintenance upkeep requires very little effort from its keeper. The reputation of this nocturnal spider deems it calm and submissive. However, the moody nature of this arachnid sometimes makes it appear otherwise. 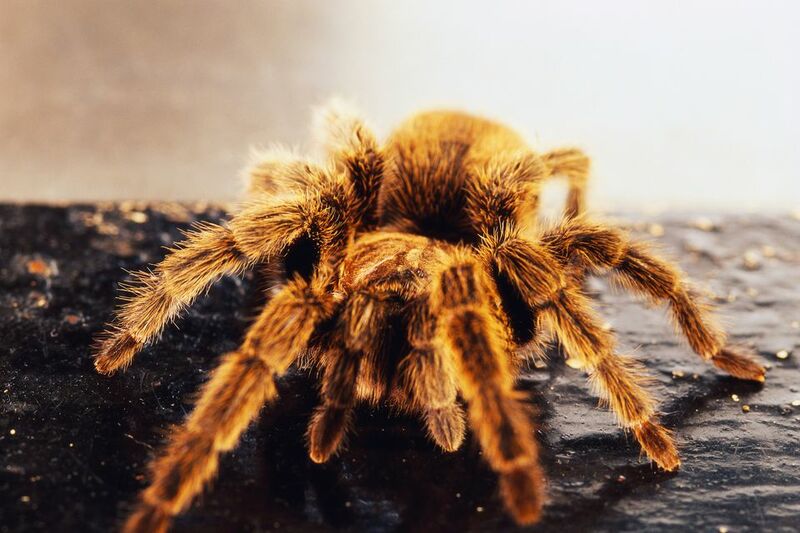 Chilean rose tarantulas who are handled often can become aggressive or fussy and will usually raise their front legs to alert you of a potential bite. They also have spine-like hairs on their abdomen that contain a mild venom. These spines will release (or shoot out from their body) when threatened and can cause an irritating rash on human skin. The digestive tract of a Chilean rose tarantula is designed specifically for digesting liquid food. So in order to fully eat its prey of insects and small reptiles, the spider vomits digestive enzymes onto its food to break it down into a liquid, before slurping it up. Chilean rose tarantulas are known for their peculiar behavior, which can include burrowing, filling their water bowl with dirt, and "redecorating" their habitat. They also participate in a courting dance come reproduction time, where the male presents a curious display to which the female responds by tapping her feet before exposing her genital area. Chilean rose tarantulas require little space, a feature that makes them coveted by beginner keepers. A small 5- to 10-gallon tank or terrarium is usually suitable. As a general rule, the width of the tarantula's habitat should be two to three times wider than its leg span and only as tall as the spider is on end. Your spider's environment should include a hiding space made from a hollowed out log, a piece of clean driftwood, or a comparable accessory found in pets stores. Cork bark or half of a small, clay flower pot can also be used for a shelter. Artificial plants (or live ones for advanced keepers) provide good additional coverage, making your pet tarantula feel calm and safe. Being desert dwellers, this species of arachnid is very hardy and less sensitive to heat fluctuations (due to the warm desert days and cool desert nights that exist in the wild). Usually, a temperature that makes you comfortable will also suit your tarantula. That said, some caretakers recommend an under-tank heating pad to supplement heat should the temperature in your home fall below 70 to 85 degrees Fahrenheit (21 to 30 degrees Celsius). And still, others warn that an alternative heat source can cook your pet if it's left on during a hot spell and can also contribute to the desiccation of the overall tank environment. Additionally, Chilean rose tarantulas dislike humidity and may act agitated should a damp spot appear in their cage. Maintaining a dry environment (but not parched) is critical to proper husbandry. The bedding that lines of the floor of your spider's tank allows it to burrow, while also lessening the harshness of the smooth glass or plastic floor. Two to three inches of peat moss, soil, vermiculite, or shredded coconut husk can be used as a substrate. Try to pick a material that can be tamped down (a touch of water may be added to achieve a perfect consistency) but will dry out quickly should the water bowl spill. Chilean rose tarantulas favor live crickets and other large, pesticide-free insects as their prime food source. So feeding them correctly also means keeping pet crickets alongside your spider and providing them with a diet that will maximize the nutrient uptake of your pet. Adult tarantulas usually eat once or twice a week, whereas immature spiders can be fed more often. Some keepers recommend giving a full grown-spider the occasional pinky mouse, however, the calcium in the mammal's bones may overwhelm the nutrient needs of the spider. So, supplementing with this food source in captivity is not recommended. Occasionally, a Chilean rose tarantula will go through a period of fasting, depending on its dietary needs. This can alarm beginner keepers, but you can usually chalk it up to your spider tending its own needs and eating should resume after a few weeks. Should your spider go longer than a couple of weeks without food or present with a shriveled abdomen, then something is off. Consult your exotics vet to make sure your spider is not dehydrated, malnourished, or stressed. A small water bowl placed inside your pet arachnid's enclosure and changed out daily should keep it well hydrated. However, take care to avoid spills when refreshing it, as this species will become stressed if their substrate is soaked. The type-A nature of the Chilean rose spider can cause it to become easily stressed. If your spider tends to climb walls, act erratic, or spend most of its time at the top of its cage, something is off (and it could be a simple as too humid of an environment). Also, hanging out in the top of the cage is a dangerous feat for this species, as a fall could cause its abdomen to split open, resulting in death. All tarantulas go through periods of molting. This is often a stressful time for your spider. It may not eat; it may remain still for long periods of time; it may even turn over and lie on it's back. If this happens, don't fret. Your tarantula is not dead, it's just going through a process, which if disturbed, could prove fatal. Once the molt completes itself, refrain from handling your pet, as it's new skin will be sensitive and it may act aggressively when picked up. Purchasing a Chilean rose tarantula from a pet store is acceptable as long as you assure this new pet has been kept in superb conditions. It is wise, however, to search out a breeder. Breeders are usually more conscientious than retail stores. Also, buying from a breeder assures you're not contributing to an industry that is depleting the number of this species that exists in the wild. Plus, the carbon footprint is lesser, too. If you want your pet to stick around for a few years, choose a female tarantula over a male. Once mature, male spiders will search for a female to mate and if one is unavailable, it will die soon after its first year. You can identify a male tarantula by its enlarged pedipalps (the second pair of legs from the front) and tarsal spurs (thorn-like projections from a segment of a leg). Do note, however, most pet stores sell males. Otherwise, check other tarantulas that can be your new pet.